Greek ferries are the best way to get around Greece as the country is made up of the longest coastline in the Mediterranean and encompasses countless islands and archipelagos. The most popular ferries go from Italy to Greece, from Piraeus (the port of Athens) to the islands and domestic crossings within the hundreds of beautiful islands. 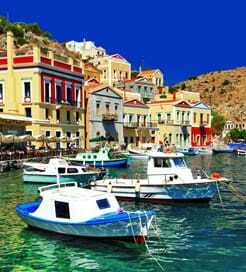 Island hopping with Greek ferries is very popular as you can visit many gorgeous islands in one holiday. There is a plethora of Greek ferry routes to chose from so you really are spoiled for choice when planning your journey. Find all Greek ferry routes and ports on our map or select an individual route for more details. If you want to travel from Italy to Greece you can embark from Venice, Ancona, Bari or Brindisi and travel across the Adriatic Sea to Patras or Igoumenitsa on the Greek west coast or the island of Corfu. How long do ferries take to Greece? 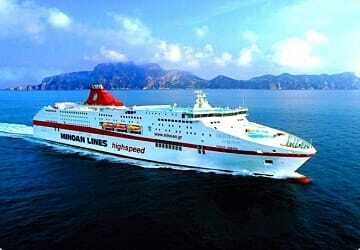 The fastest route to Greece is from Brindisi or Bari to Corfu with a crossing time of only 8 hours. To the Greek mainland the fastest sailing is Bari – Igoumenitsa. The longest crossing is Venice to Igoumenitsa with a duration of 30 hours and 30 minutes, but this means that you can relax and safe on a long overland drive. Depending on your selected route ferry services operate on a schedule between once and 11 times per week. Some of the most popular islands are the Cyclades islands of Santorini, Mykonos, Naxos, Paros and Milos, as well as the island of Crete, Rhodes, Skopelos, Symi, Kos and Corfu to name but a few. Head over to our Greek Islands page for more information about ferry services within Greece. Should I book Greek ferries in advance? Despite the wide range of ferry routes and sailings offered on Greek ferries, especially in the summer months ferries can be fully booked in advance and prices tend to increase the closer the date of departure comes. To ensure you get the choice and price that best suits your travel plans. View timetables and prices, compare routes and ferry operators, read reviews on ships, on board experience and get information about port and terminal addresses and much more. Book your next Greek ferry now online with Direct Ferries and safe, as we have the best prices and offer special deals and discounts.